Russian officials treating explosion as 'mass homicide attempt,' say explosive was 'filled with projectiles.' At least 10 injured. 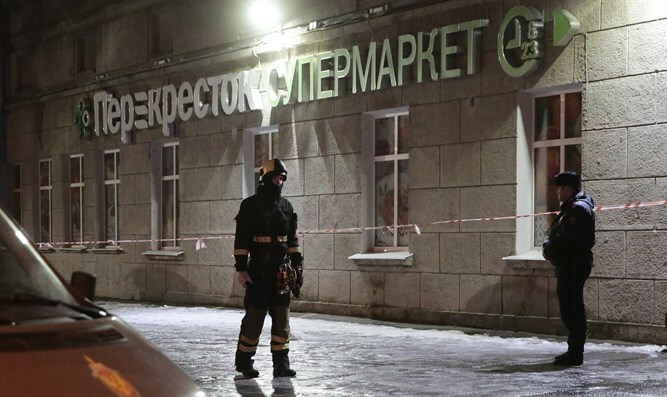 At least 10 people have been injured to varying degrees of severity as a result of an explosion which took place in a busy St. Petersburg supermarket this evening. According to Reuters, Alexander Klaus, the head of St. Petersburg's investigative committee, said that "all possible versions of what has happened are being worked on." Earlier this month, Russian President Vladimir Putin telephoned US President Donald Trump to thank him for providing US intelligence which the Kremlin said helped prevent a bomb attack at a cathedral in St. Petersburg, as well attacks at other sites. The Kremlin said its security forces had detained followers of the Islamic State (ISIS) terror group who had been planning a suicide bomb attack on the cathedral. Russia has been targeted by several Islamist attacks, including an attack in April that killed 14 people when an explosion tore through a train carriage in a metro tunnel in St. Petersburg. Credit for that attack was claimed by the Imam Shamil Battalion, a little-known group claiming to have links to Al-Qaeda. In August, Russian security forces foiled an ISIS terror plot slated for September 1- on the first day of school.